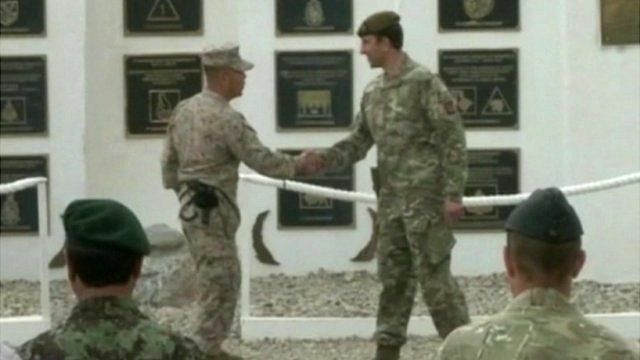 Britain hands over Helmand command Jump to media player Britain formally hands over command of military operations in Helmand province in Afghanistan to the US. UK nears end of Afghanistan pullout Jump to media player British military forces in southern Afghanistan have now closed or handed over all but two military bases, ahead of their final withdrawal. Afghan women's vice-presidency hopes Jump to media player For the first time in Afghanistan, there is the prospect of a woman becoming vice-president, a major change in a country with an international reputation for abuse of women's rights. Britain's command of military operations in Helmand province in Afghanistan has been formally handed over to US forces. It is the latest step in the UK's withdrawal of combat troops from the country, which is due to be completed by the end of this year. Forces remaining will be part of the US-led Regional Command (South West).